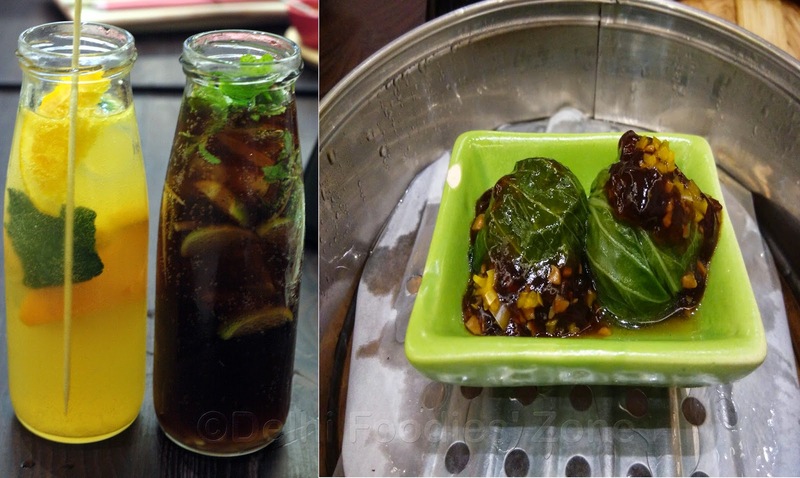 Joining the Pan-Asian brigade of Diva Kitsch, Yum Yum Tree and others is a colourful cafe called Yum Yum Cha in a busy mall in Saket. To begin with, Yum Yum Cha takes Sushi and Sashimi from fine dining restaurants to a more casual, relaxed setting. The food is stunning and how they dole out such gratifying fare from a tiny space at Select City Walk mall, Saket is a wonder. Well, not really. What else would you expect when you get to know Yum Yum Cha is a product of the famous sibling The Yum Yum Tree? The 40 cover dining space is an open cafe done tastefully with colourful Japanese Origami dumplings, tea pots, geisha, slippers denoting casual dining, tea-pots and more. These symbols are also embroidered on napkins and on aprons of the ushers and would keep you visually engaged while you wait for your order (which won’t take very long). 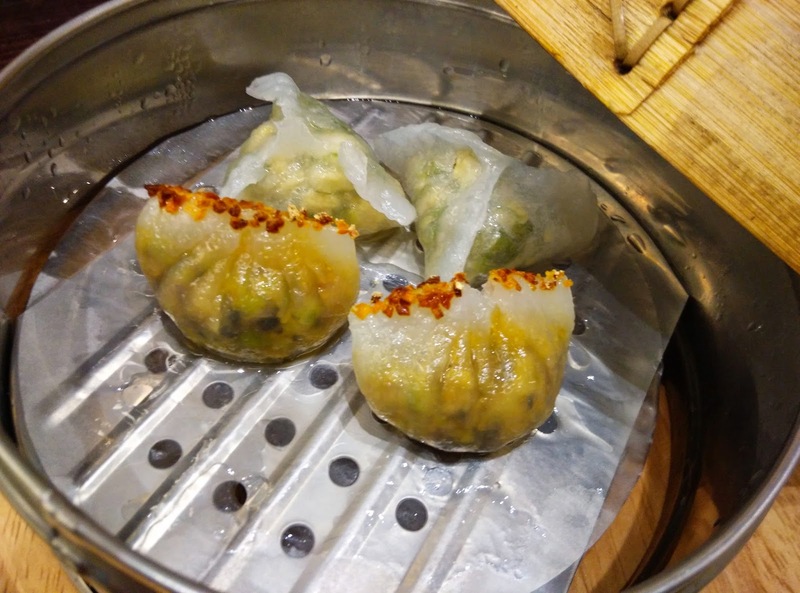 While the Spicy Asparagus dumplings (4 pieces for Rs 245) with a filling of asparagus in satay sauce and Bok Choy dumplings (4 pieces for Rs 245) with vegetables and garlic, chilli are good, the star of the show is the Crispy Vegetable Cheung fun (Rs 385 for 6 pieces). Asparagus tempura and Spicy avocado Sushi come at Rs 485 for 8 pieces. Club that with a nice drink and you have an afternoon meal. We tried the Black Magic and the Thai orange and Kaffir Lime fun bottles from the listed beverages. The drinks, however, were a little underwhelming. Some tweaking and intensifying of flavours would reap yummy benefits. The Crispy Corn cake (Rs 285) was topped with chillies and burnt garlic. Bang on flavour, pretty presentation, tweaked for the Indian palate (read spicy and full of garlicky goodness) this was a show stopper and comes highly recommended. The sizzling basil & chilly sticky rice were served up beautifully in a hot stone pot in which it was assembled and cooked. The server stirs it up right on the table for an interactive touch and some fun on the table while you drool into a coma by aroma. The Paper Hot Pot based on Japanese Nabe will have the people on your neighbouring table stealing glances. We ordered the Ramen soup with noodles and it was pretty acceptable. Icecream. For the uninitiated, Mochi is made from a glutinous Japanese rice which is pounded into a desired shape and coloured suitably. The ice-cream comes filled in the Mochi. We tried the classic Matcha Green Tea which is a Skeeter favourite. The coconut and Jaggery Mochi is a sensational delight for those who like things a little sweet. The service was good and a tad fast. It was heartening to see owner Prathna Tuli enthusiastically manage tables rather than leaving the task on the shoulders of their able staff.